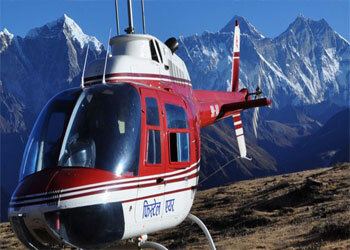 Annapurna Base Camp Trek 7 days is arranged with just a trail of trekking within 7 days in Annapurna base camp. The is the Short Version of Annapurna Base Camp trek that is perfect for those who has no time to do the regular trek to the Annapurna base camp. This offers enough time to witness the staggeringly beautiful peaks of all the Annapurna giants that encircle the basin: Annapurna 1 (8091m), Annapurna South (7273m), the Glacier Dome, Gangapurna (7454m), the unclimbed Fang (7647m), and the fishtail peak of Machhapuchhare (6997m). 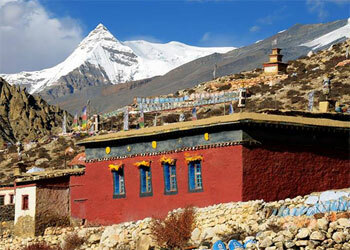 The short Annapurna base camp trek also guarantees you fun, pleasure and a magnificent insight into the natural and cultural heritage of the tiny Himalayan country, Nepal. It is one of the most beautiful treks passing through the diverse ethnic group’s culture and verify vegetation forest and wildlife. The trek starts from Nayapul about 1 hour 30 minutes’ drive from Pokhara. You feel saturated by nature and unidentifiable calm in the heart and soul. The main part of Ghandruk Valley is on the top of the ridge, more than 500m above. Very almighty rhododendron forests and fine terrace goes on passing through our trail to the Chhomrong village. Machhapuchhare Base Camp is another heavenly trail with stupendous mountain views including Himchuli, Gangapurna, and the ever-changing Machhapuchhare, which sheer triangular face takes on yet another aspect here. The trail finally stumbles across moraines and reaches the world of ice and snow Annapurna sanctuary from where you will see incredible 360-degree views of the Annapurna ranges and above the massive Annapurna glacier. Collecting lifetime experience, we retrace from Annapurna Base camp to Chomrong and then to the Jhinu Danda where you can enjoy the natural hot spring small bath pools. After that, the trail leads to a rhododendron forest and passes to Pothana and Tolkha through charming villages of Nepal’s ethnic communities of the Gurung, & Magar. This amazing trek finishes at Phedi from where we take a short drive to Pokhara. Trip Snippets: 07 days, 6 nights Lodges, Breakfast lunch and dinner during the trek. Take a 30min drive to roadside shacks of Phedi. The start of the trail heads up the hill on a set of steps across the road. The main part of Dhampus valley is on the top of the ridge, more than 500m above. The trail climbs to a rhododendron forest and passes to Pothana (1990m). The view of Machhapuchhare (6997m) is excellent from here, except that from this angle it looks more like Matterhorn than a fish tail. The trail emerges in the main Modi Khola valley and reaches Tolka. Day 02: - Tolka trekking to Chhomrong (2040m): Walking distance 5-6 hours. After breakfast we will working through nice terraces to Landruk a beautiful Gurung village provides you excellent view from Landruk trail continues to Jhinu. Very almighty rhododendron forests and fine terraces went passing through our trail to the Chhomrong village. Above the village is the mighty peak of Annapurna South with the Mt. Fishtail, facing it across the valley. Chhomrong is a beautiful village with lots of Lodges providing good facilities. Chhomrong is a gateway to Annapurna Sanctuary trek and inhabited by Gurung, one of the major ethnic groups of Nepal. Leaving Chhomrong, the trail descends via a stone staircase and crosses the Chhomrong Khola on a swaying Suspension bridge. Then climb out of the side valley passing through deep forests of bamboo, rhododendron and oak. 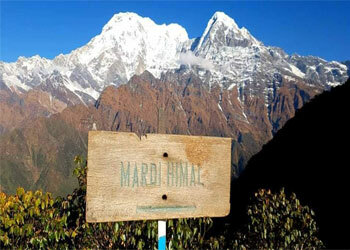 The portion of the day’s trek follows another ascent to Kuldi (2470m). Descend a long, steep, slippery stone staircase into a deep bamboo and rhododendron forest to the village of Dovan.Meals included: Breakfast, Lunch and Dinner. A trek of narrow Modi Khola valley brings you almost to the base of M.B.C. There’s technically no such thing as ‘Machhapuchhare Base Camp’, since ascents of the mountains are prohibited. The mountain views are stupendous; the panorama includes Hiuchhuli, Annapurna ranges and the ever-changing Machhapuchhare. This area is called the Annapurna sanctuary since it is totally surrounded by mountains. A huge amphitheater enclosed by a solid wall of snow-capped peaks which include Annapurna I, Annapurna III and the fish tail spire of Machhapuchhare.Meals included: Breakfast, Lunch and Dinner. Day 05: - Machhapuchhare Base Camp Trek to Annapurna Base Camp (4130m/13550ft) and back to Dovan. The climb to Annapurna Base Camp takes under two hours. You descend a small ridge branching out from the mountain pass to mountainside with widespread terraced fields showcasing tranquil meadows and lush fertile farming land. As you reach Annapurna South Base Camp, witness awesome picturesque landscapes, majestic panoramic view of snow-capped mountainous peaks and varied Himalayan cultural settings tucked beneath the southern slopes of the Annapurna massive. 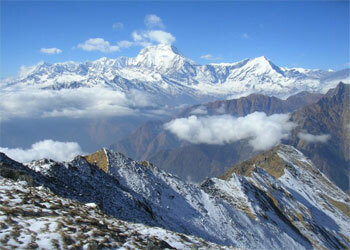 Tremendous Annapurna Range stops your heart beat for a while; whole day without rest chill out around to explore ABC. At the end we will drop down back to Dovan for the night.Meals included: Breakfast, Lunch and Dinner. Ascend on a long, steep, slippery stone staircase from the village of Dovan. Climb out of the side valley passing through deep forests of bamboo, rhododendron and oak to Chhomrong, from here steeply down trek more 45 minutes take to you Jhinu, where you can enjoy the natural hot spring small polls near Modi Khola. Meals included: Breakfast, Lunch and Dinner. Today we will walk the down part of the trail mostly flat with spectacular mountains views. Traverse high above the river on a wide stone-paved trail to a large and prosperous town Birethanti (1000m). We continue our walk to Nayapul and catch a private vehicle to get to Pokhara. We spend a beautiful night in Pokhara city. You can have some expedition over famous city streets, End of your trek.